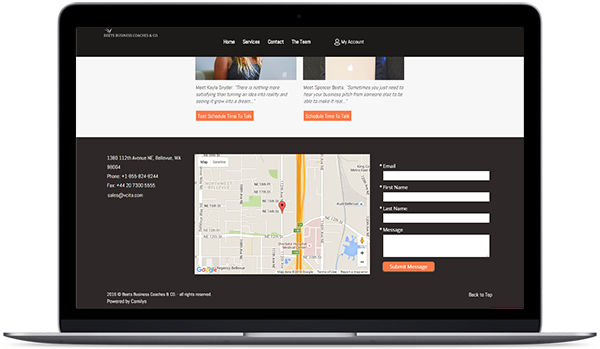 A contact form that delivers more clients and contacts! Select layout, size, texts and colors to perfectly fit any website. Add mandatory or optional questions for contact requests, in any language. Get instant notifications. Reply from your computer, tablet or phone. Click to return client calls. vCita HTML contact form works well with any design and template. Our responsive design fits any device including tablets and phones. Approach your visitors with a contact form add-on on every page of your site. Invite clients to leave their details, request a call-back, ask for a price offer, fill in their personal information and more. Go beyond the contact form with unlimited archive for contacts and client communication. Easily search for contacts and follow up: take notes, edit contact information, and track sent emails. 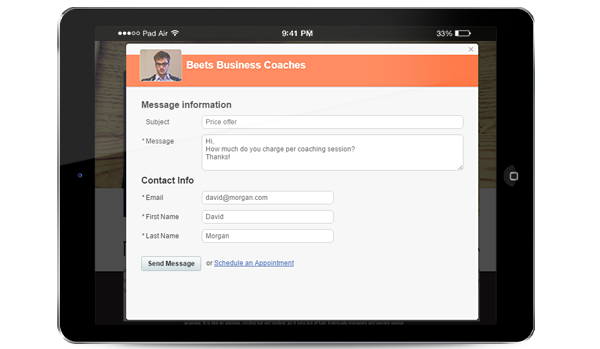 It’s great for managing clients and follow-ups across your whole team. The vCita contact form plugs into any web platform or Facebook page No programming required. Try our WordPress Contact Form Plugin, Faceook app, Joomla, WIX Contact Form Plugin, Blogger Add-on and more. "vCita is an incredible tool that helps our business grow and look professional." Create a custom form within minutes – no programming or design needed! Prompt website visitors to leave their contact details by embedding your form within a page on your website. Attract attention by popping up a “contact us” button on your website pages, driving potential clients to leave their details.